CCopasiException class. A more elaborate class description. Definition at line 30 of file CCopasiException.h. 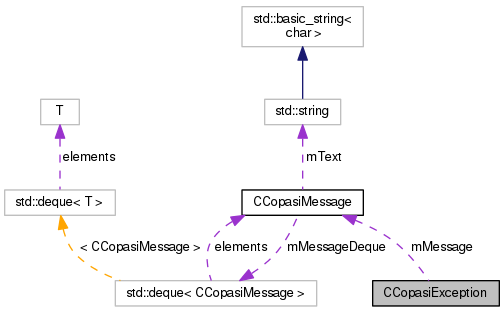 Definition at line 23 of file CCopasiException.cpp. Specific consructor. Creates a exception with a message. Definition at line 27 of file CCopasiException.cpp. Definition at line 31 of file CCopasiException.cpp. Definition at line 33 of file CCopasiException.cpp. Referenced by Arguments::handleCommandLine(), CModel::load(), main(), CLyapTask::process(), CTrajectoryTask::process(), CTSSATask::process(), CCrossSectionTask::process(), and CReaction::setScalingFactor(). Definition at line 57 of file CCopasiException.h.